There has been quite a bit of discussion lately about various food companies deciding to label their products for GMO content in response to Vermont’s GMO labeling bill. I’m still mostly indifferent to GMO labels, and frankly, have grown tired of this particular debate. But there seems to be at least one misconception that I wanted to briefly address. If you follow the GMO issue at all, you’re probably aware that a large majority of GMO crops currently being grown are herbicide tolerant. In 2015, 89% of corn and cotton, 94% of soybean, and 100% of sugarbeet in the US were genetically engineered to have herbicide tolerance. A very large majority of herbicide tolerant crops are Roundup Ready, which makes them tolerant to the herbicide glyphosate. This allows farmers to spray glyphosate, better known as Roundup, to the field without causing damage to the crop. Herbicide tolerance is, by far, the most dominant GMO trait on the market. This has led at least some people to believe that non-GMO products are less likely to have been sprayed with herbicides. This is simply not the case. Long before we had GMO varieties, we were already spraying herbicides on those same crops. That’s because nearly all crops are naturally tolerant to a variety of other herbicides; no genetic engineering required. The figure below shows USDA data on the percentage of corn, soybean, and cotton acres in the US that were sprayed with herbicides between 1980 and 2010. 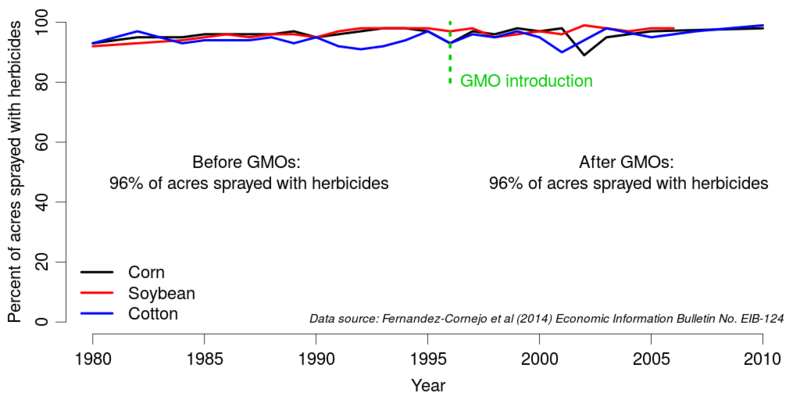 Around 96% of all three crops were sprayed with herbicides before the introduction of any GMO crops, and that value didn’t change after adoption of GMO crops. The bottom line here is that a GMO label will not give any indication of whether the product has been sprayed with herbicides, because non-GMO crops are also highly likely to be sprayed with herbicides (albeit a different set of herbicides). The exception to this would be crops produced organically. Although organic farmers commonly use various other types of pesticides, there are no herbicides registered for use directly on organic crops. NOTE: my weed science colleagues will almost certainly be annoyed with me for calling GMO crops herbicide tolerant rather than herbicide resistant. The Weed Science Society of America has distinct definitions for these terms, and by those definitions, Roundup Ready (and Liberty Link) crops would be considered herbicide resistant, not herbicide tolerant. However, this distinction is largely irrelevant to the public discussion, so I stuck with the terminology that is more commonly used by both the public as well as the USDA when discussing this technology.